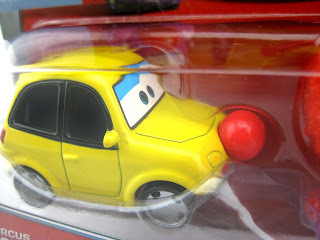 Luck was with me tonight as a continued my search for the latest Disner·Pixar cars. I was absolutely thrilled to have found yet another Mattel 1:55 scale "super chase" in the wild (this time at my local Target)...Circus Forklift & Circus GT 2-Pack! Out of the five circus car releases this year, this is the one I was most excited for. I actually gasped as when I saw it there (behind a few other cars) there on the pegs! 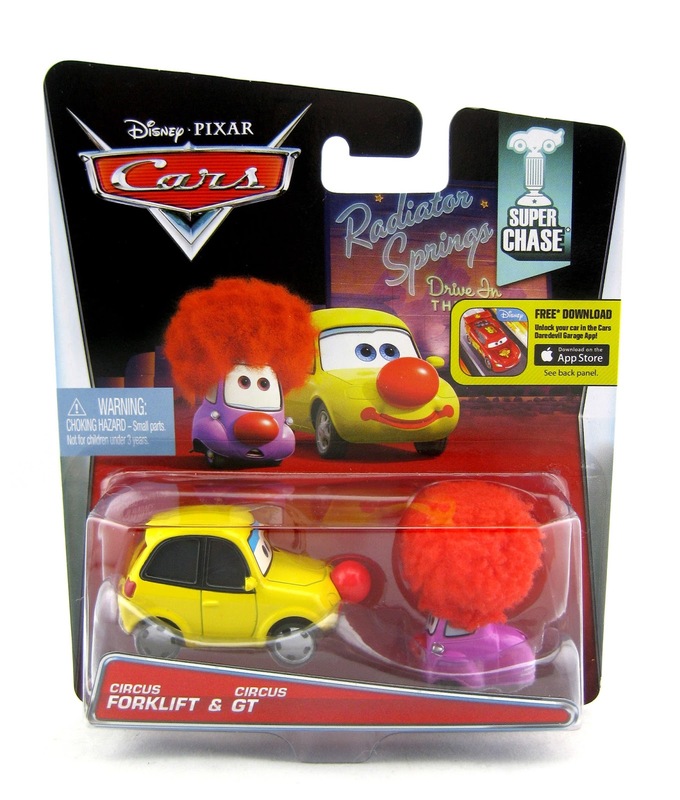 What is a "Super Chase" you might ask? Well, it basically just means an ultra rare release (no more than 4,000 units are produced). 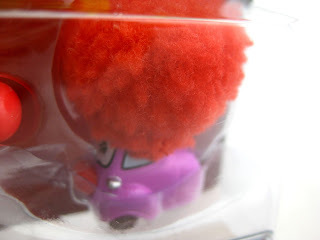 They are extremely difficult to spot in stores; in fact, this is only the fifth super chase I've ever found (the rest I had to resort to eBay for). One of the funniest and most creative scenes in Cars is during the end credits when Mack (voiced by John Ratzenberger, who also voices a character in every Pixar film) is parked at the Radiator Springs Drive-In Theater. 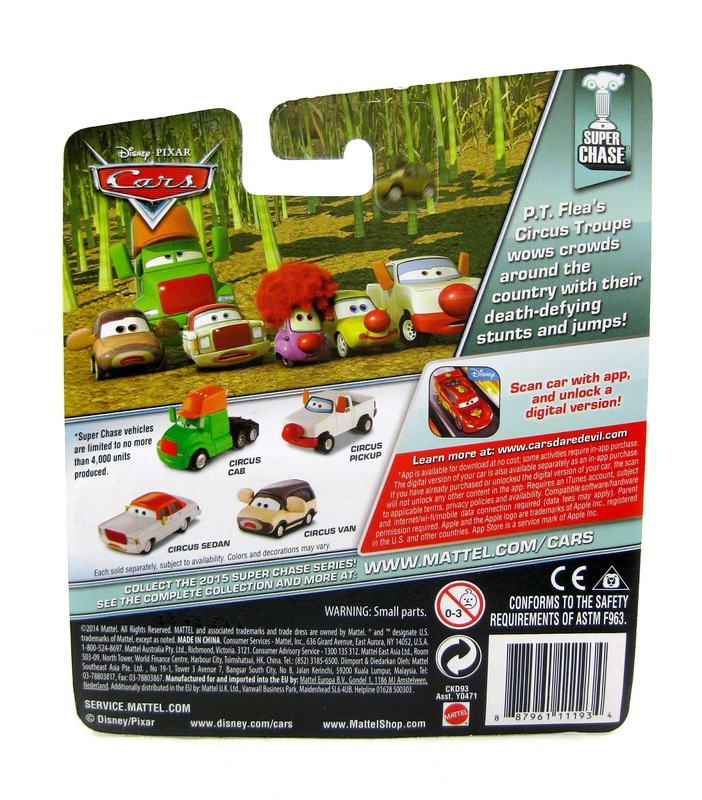 There we see many of our favorite Pixar characters in car form such as Buzz, Woody, Hamm, Mike, Sulley, the Yeti, PT Flea, Flik and the "circus cars" (as seen in the screen shot above). It's ultimately just fun to see Pixar and John Ratzenberger poke fun at themselves a bit! The scene can be watched here. Never gets old! 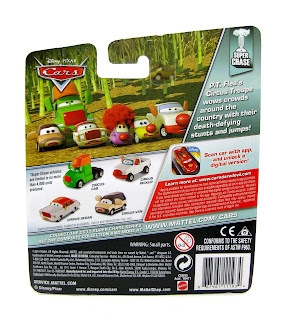 As seen on the back of the package, the other four circus cars are also available as super chases: Circus Cab, Circus Van, Circus Pickup and Circus Sedan. I'm so happy they ended up making all six of these guys since we officially now have every character represented from that entire Drive-In scene! Now all I need is to find is the Sedan and the Pickup to complete my collection. This is such an awesome and unique set of cars and I'm so glad it's finally released. It's too bad it's so hard to find. If you're having trouble tracking this one down in stores, eBay or Amazon might be your best bet.